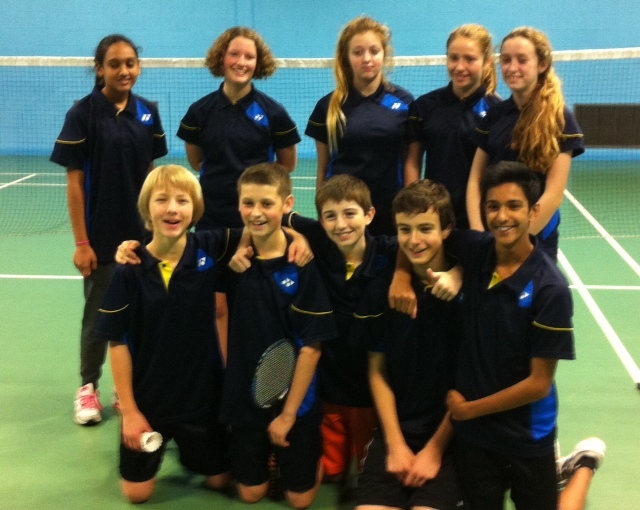 MATCH REPORT U15 Shires Tournament -Leics ‘v’ Norfolk2Sunday 2nd November 2014. The kettle is on, snacks and cakes on the table and our 10 county players are warming up ready for their first U15 Shires match of the season against Norfolk2 team – bring it on! 11.09am and the Mixed pairs games begin … only 5 minutes in and Ella and Martin are victorious in their 1st game and after another 5 minutes see their 2nd and final game in the bag. Closely followed by Eve and Ryan, Jasmin and Tom and Hritika and Nikhil who only conceded 12 points in both their games. Team Fitness was shown to have definitely improved especially when our Norfolk opponents requested a 5min break between the Singles and Doubles games; all our players were ready to go again after a quick drink. What a great start to the Shires season, WELL DONE and congratulations to all the players, it was a pleasure to watch and see how every player has improved since the start of the new season. Here’s to our next Shires gathering against Yorks2 at The York Railway Institute on 23rd November. Boys – Nick Twells, Cameron Collins, Sam Wood and Joe Hill. The day didn’t start well with the Twells Team Bus being delayed due to a SWAN on the M1!! This limited the amount of warm up time that the Team had, which did have an impact on the first Match, which was against a strong Cheshire Team. As there were only 4 Counties entering the Tournament the format was changed to 4 mixed, 4 singles and 2 doubles matches., a total of 16 games up for grabs. The mixed doubles started well with Nick and Wembley showing the way with a comprehensive 21-11 victory, which was supported by an excellent performance from Joe and Isobel who won 21-14. Chloe and Sam narrowly lost 18-21 and a nervous Cameron and Eve also lost 10-21, which meant we were level at 2-2. Then came the dreaded singles games!!! With 8 players in action only Ella came up trumps and won 21-11. That meant the score shot up to 3-9 Oh Dear!! Next came the doubles, wow what a difference with, Sam & Nick, Cameron & Joe, Chloe & Wembley and Ella & Eve winning every game to finish the result 7-9. Chris Hall, now looking less green than he was a few hours before!, gave a stirring team talk. This spurred on the team, who started well again with Sam & Chloe and Cameron & Wembley winning. 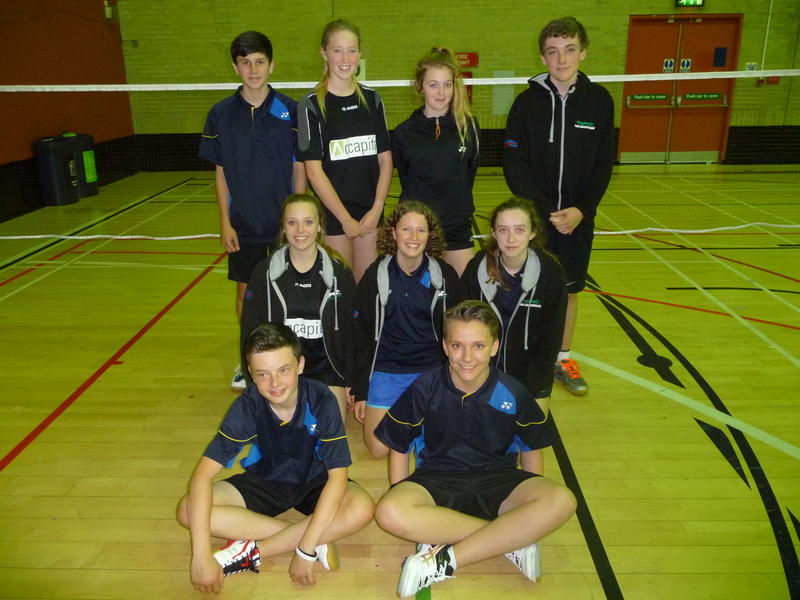 Nick & Ella and Joe & Isobel had great matches and both lost narrowly. Again the match was in the balance at 2-2 before the dreaded singles!! Nick started a very tough match and came out winning 21-20. This set the tone and Joe, Chloe, Ella and Eve all won their matches. This meant the score was 7-5, we can play singles! Next came the doubles with the pairings of Nick & Sam, Cameron & Joe, Chloe & Wembley and Eve & Isobel all winning the matches with some excellent badminton, most notably Eve & Isobel winning 21-8. The best moment of the match being a TAXI on Nick! The final result was 11 – 5, a great result, bring on the next match. With the Team buoyant from the win against Yorkshire, this lead to a good start in the mixed doubles with Nick & Wembley, Sam & Chloe and Joe & Eve winning their matches comfortably and Cameron & Ella just losing out. The score was now 3-1 going into the singles. Cameron, Sam, Joe, Chloe and Wembley won their games to leave the score 8-4 going into the doubles and needing one more game for victory. Nick & Joe played some great badminton to win comfortably 21-11, with a few ‘pings’ and laughs along the way. Next up was the Cam-Sam show, who won a very competitive match. Wembley and Chloe dominated their match 21-3. Eve & Isobel had a much tougher match against a strong pair and they lost their match. The final team score being 11-5, another great performance from the Team. We finished 2nd place overall, with a great chance to push for 1st place next time. Well done and thanks to all the players, parents and Chris & Pete Hall for all their help. I am pleased to say that Babington College is open again from Monday 27th Oct , so all sessions will be on as normal. Reminder – there will be NO TRAINING ( at Babington cc ) on SATURDAY NOV 8TH due to the Annual under 15yrs National Tournament. We are really sorry about all the disruptions in your child’s training and hope that things will now settle down. Babington college are trying their best to avoid further disruptions and to keep things safe for us all , but please be vigilant when dropping your children off and accessing the building , this is a major project. Please see an email below regarding payments . Sorry to inform you that Babington College is closed today and over the weekend . The work being carried out is taking longer that expected . We are expecting it to be open on Monday 27th Oct. Please check your emails on Monday for more information . We apologise for this inconvenience but its out of our control. The safety of the participants is the issue at the moment. With faster match-play, PowerPlay points and tense tie-breaks, the UK’s first ever National Badminton League got off to a flying start on match-night 1. Now your local NBL team Loughborough Sport take centre stage as they face Team Derby in league action on 3 November (Match-night 2), starting 7.45pm. Be there to support double Glasgow 2014 medallist Lauren Smith and the star-studded Loughborough Sport squad in their first home fixture of the season at the iconic Sir David Wallace Arena, Loughborough University. Book the edge of your seat at The David Wallace Arena Tickets for Loughborough Sport v Team Derby are now on sale with SKY Tickets, priced £5 for children and £8 for adults. Special offer student tickets and group deals are selling fast but are still available. After a meeting with the electricians that has just taken place the Hall will be unavailable until Tuesday 21st October. They have found more asbestos and the work will take an extra 2 days going through the week-end and on to Monday 20th hence not available for use until the 21st.